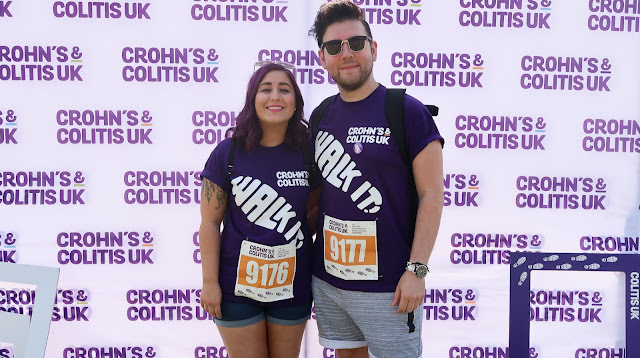 Last year, my first ever blog post, was a post about the Crohn's & Colitis UK Walk It event in Newcastle. I thought why not make it annual, and blog about this years Walk It event too! 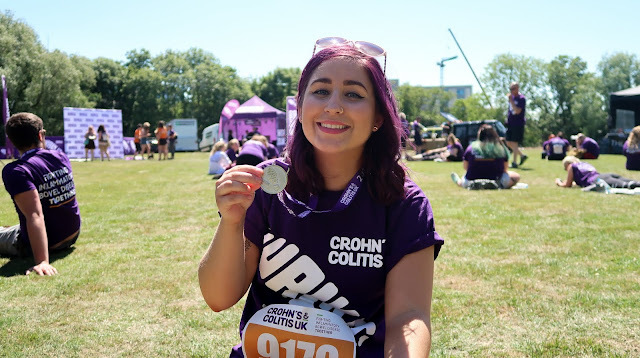 Just in case you don't know or you're new to my blog - I have Ulcerative Colitis (diagnosed in 2016) and I write an awful lot about it here on my little space on the internet! It was held in the same place, a beautiful spot in Leazes Park, overlooked by St James' Park and the event was bustling with more faces than last year. The event definitely rose in popularity and I don't blame it! 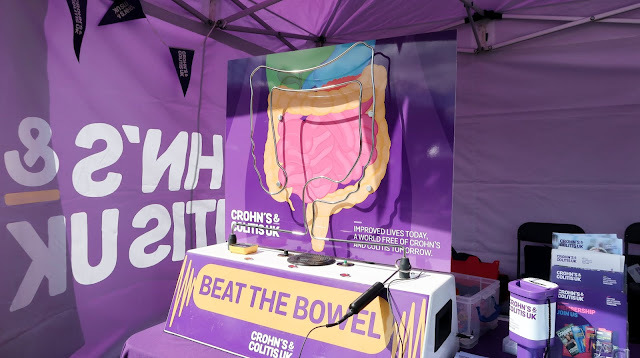 There was live music, photo props, face painting and glitter, and activities like "beat the bowel"; not to mention plentiful toilets for all us bowel buddies that needed them. It was a scorching hot day - as high as 25°C. Unfortunately, that meant it was a little too hot for my dog Daisy to come along this year (her little paws would burn on the hot pavement), but Eric and I thoroughly enjoyed the heat. Well, that's until we got to walking, then we just felt like we were melting the whole way round! 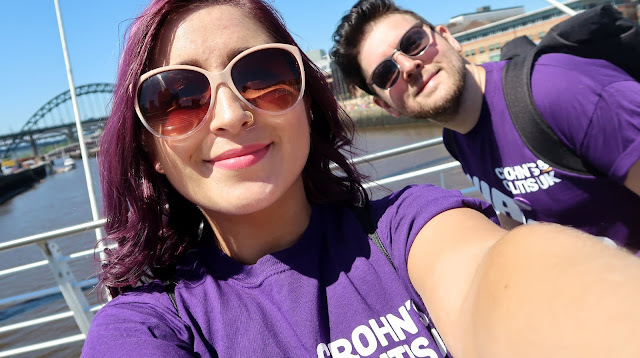 Because it was such a lovely day, Newcastle was heaving with people, so that meant there were even more people to watch our sea of purple t-shirts parade around the town, and I definitely heard a few people murmur the charity name as we passed by. The more people that find out about us, the better! 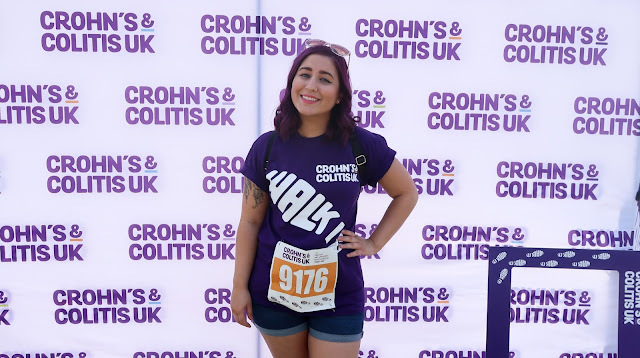 Before I got diagnosed, I had no idea what these conditions were, so raising awareness is super important to me. 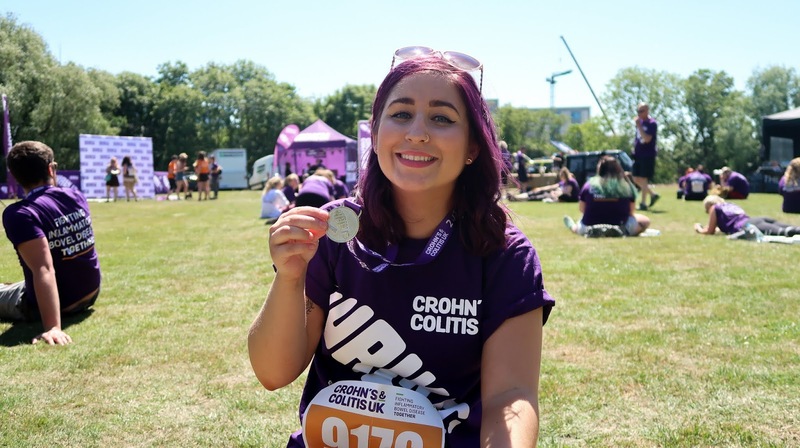 Last year I managed to do the 5k walk, when my colitis was considered moderate, so I was a bit more poorly than I am now. This year, my colitis is only mild so I really want to push myself and do the 10k walk. Now, I'm not a very fit person so I thought it would be a struggle; but to my own surprise, I didn't even whinge once! I'm usually a whiny person, so this was an achievement in itself. The walk stretched from Leazes Park, past St James' stadium, down Northumberland Street to Greys Monument... all the way down to the Quayside, across the swing bridge, past the Sage and back along the Millenium bridge. Oh no, it didn't end there. We went back up the hill towards Manors, and up to Northumbria University, to Civic Centre and the Great North Museum before making it back to Leazes Park. If you're not from Newcastle it would have been a fabulous walking tour! When we made it back to the event village we were greeted with cheers, horns, medals and a good ice cold bottle of water. I'm definitely very chuffed I did the whole 10k walk, and it was a lovely day. Its such an accessible way for people to raise money for a great cause. I know lots of people do marathons or jumping out of aeroplanes but thats not something I'm quite able to do. So, to be able to join in with this event, and to feel like I'm helping in some way, makes it quite a large part of my year. I hope that Crohn's & Colitis UK continue to hold these annual events in Newcastle because it's something I now look forward too for the summer. This year, Eric and I managed to raise £175 for the charity and so far in total (as I'm writing this) I know the charity has raised £153,840. They still have events across the UK to do, so that's a brilliant amount to have achieved. If you would still like to donate please take a look at my Just Giving page, which is still open for sponsors! 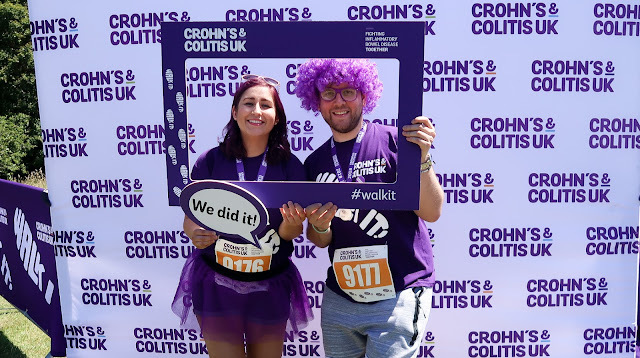 So thank you to Crohn's & Colitis UK for their endless achievement when it comes to raising awareness for Crohn's Disease or Ulcerative Colitis, and for hosting such fantastic events. I'd also like to quickly thank Eric for supporting me, and doing all of this alongside me. And not forgetting everyone that donated to my Just Giving page, your money goes directly to the charity and will help provide information and support, fund important medical research and help the charity continue to campaign for better services and care for people with these illnesses!